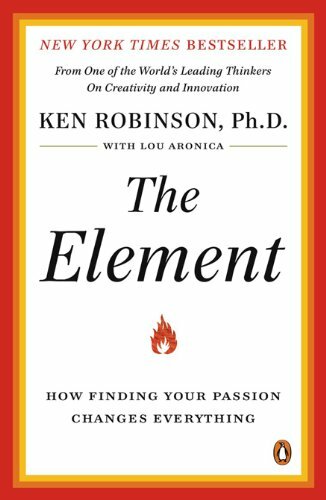 Continuing to slowly make my way through Maria Popova‘s list of 7 Must-Read Books on Education, I recently picked up #2 on the list, The Element: How Finding Your Passion Changes Everything by Sir Ken Robinson. It only seemed fitting to read it this week, as I am going to see the man speak tonight at the Vancouver Playhouse Theatre. 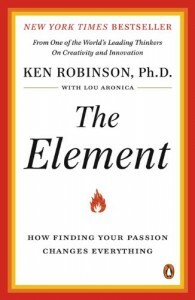 In The Element, Robinson gives us countless examples of famous (and sometimes not so famous) people and the struggles they endured on the way to finding their passions. We learn that Paul McCartney hated music class as a teen, Aaron Sorkin wanted to be an actor, and that Meg Ryan wanted to be a writer. We’re treated to stories of people who defied the odds and pursued their passions, including Simpsons creator Matt Groening, Huffington Post founder Arianna Huffington, Nobel physicist Richard Feynman, and Fleetwood Mac founder Mick Fleetwood. At times I found myself getting a little bit tired of all the celebrity worship, although this format tapers off a bit towards the latter third of the book as Robinson begins to write at a more personal level. He provides some background about his own childhood and the hardships he faced in dealing with polio, realizing he would not be a professional soccer player, and then later excelling in school as a young teen, perhaps due to a fortunate change in policy in British education. It’s a valid point, and if my memory serves me correctly, is similar to the message conveyed in the final chapters of Thomas L. Friedman‘s The World Is Flat. Imagination is what makes us human, and gives us the power and capacity to progress and evolve. Robinson goes on to define “creativity as applied imagination” which I think is a very insightful way to put it. We can imagine in our heads, but it takes creativity to turn our thoughts into meaningful products. He goes on to offer a more organic metaphor relating to plants, farmers and gardeners: “The plant grows itself. Farmers and gardeners provide the conditions for growth.” The metaphor is quite similar to one offered by Douglas Thomas and John Seely Brown in A New Culture of Learning (#3 on the list), in which they suggest we should think of classroom culture as behaving more like a bacterial culture growing in a petri dish, cultivated by a teacher who acts as lab scientist, providing structure and conditions for growth. I found this book to be enjoyable and inspiring, even if some parts of it were repeating points we’ve all seen in his TED talks. I’m looking forward to reading more from Ken Robinson, and even more so to seeing him speak tonight.